Events > Brisbane Big Air Event ! Brisbane Big Air Event ! One day event with a three weekend period for competition. Competition will be called on when suitable conditions are forecasted. 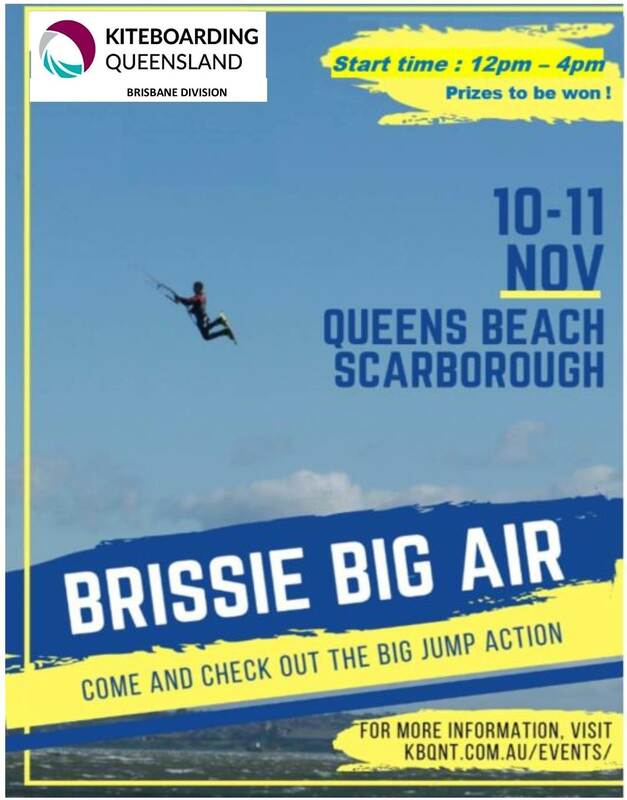 Kiteboarding Queensland is excited to announce the upcoming inaugural Brissy Big Air event to be held at Queens Beach North on the Redcliffe Peninsula, 20km North of Brisbane. The event will be held on the first windy day on either the 10-11, 17-18 or 24-25 November. We are expecting up to 50 kiteboarders competing for the Biggest Air, the Best Wipe out and Best Trick. The world record for the biggest kiteboarding air is 28.9 metres. Sausages and drinks will be available and we are hoping for a great show for the spectators of one of the fastest growing sports in Australia. Think smart, BE SUN SMART, supply your own shade, sunscreen and hat!